It’s actually money though, of course, it’s Bill Gates! 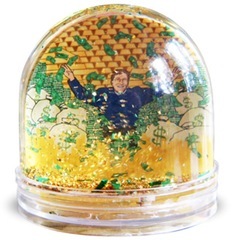 I wouldn’t buy it and I suppose if you was to look at Bill frolicking and having $ swirling around his head in front of a print that says “I’m really, really RICH” everyday, you’d eventually couldn’t help but smash the thing to pieces. That’d be $19.49 in pieces and Gates doesn’t give a damn. 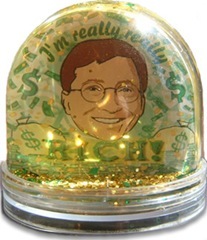 But, a nice gift for Bill Gates fans by Geek Culture. They have those assemble-it-yourself snowglobe kits. This entry was posted on Thursday, December 13th, 2007 at 6:13 am	and is filed under Seasonal/Holidays, Shopping. You can follow any responses to this entry through the RSS 2.0 feed. You can skip to the end and leave a response. Pinging is currently not allowed.